It's cutting it a bit fine, but I did get it done before the end of the month. The lesson this month came from Ann Fahl. She recommended going beyond the basic stipple stitch, Now to me, the meander and stipple stitch aren't that easy, but it's definitely got easy with the free motion embroidery I've been doing. 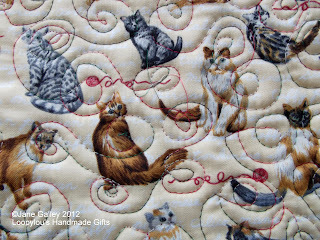 I decided to go with swirls, as it went with the idea of cats playing with wool. 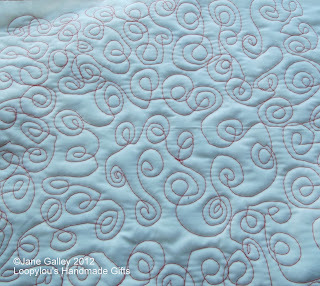 This is the most comfortable I've felt whilst free motion quilting, I'm even tempted to give this a go on a larger quilt. The whole purpose of this embroidery course, is to push the boundaries, so now, paper has been added to a piece of hand embroidered cloth. 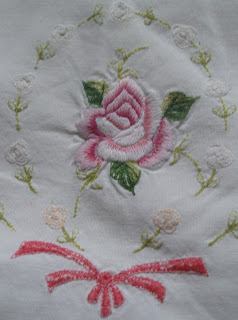 This is silk paper that has been machine embroidered, and then embellished by hand. 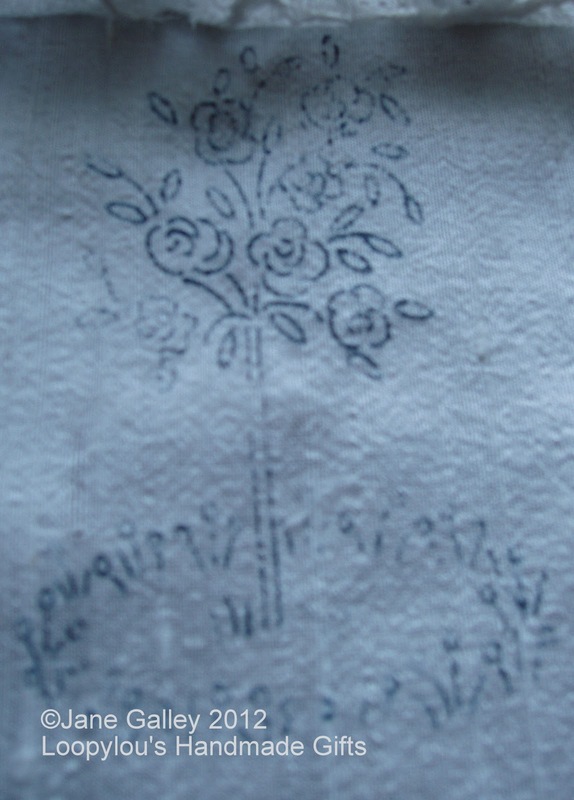 The paper was carefully cut out around the machine embroidered flowers and then very gently stitched to the cloth. To do that. 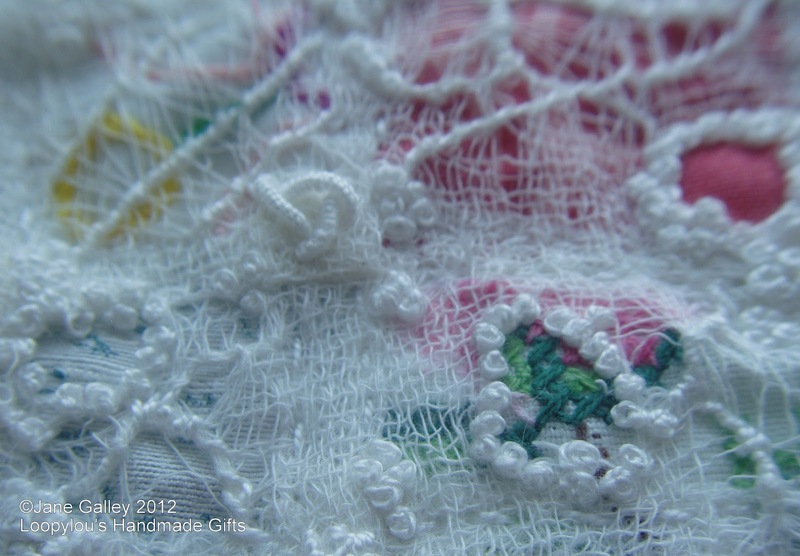 I've used a mixture of french knots, blanket stitch, bullion knots and blanket stitch lace. This technique works just as well with buttons. 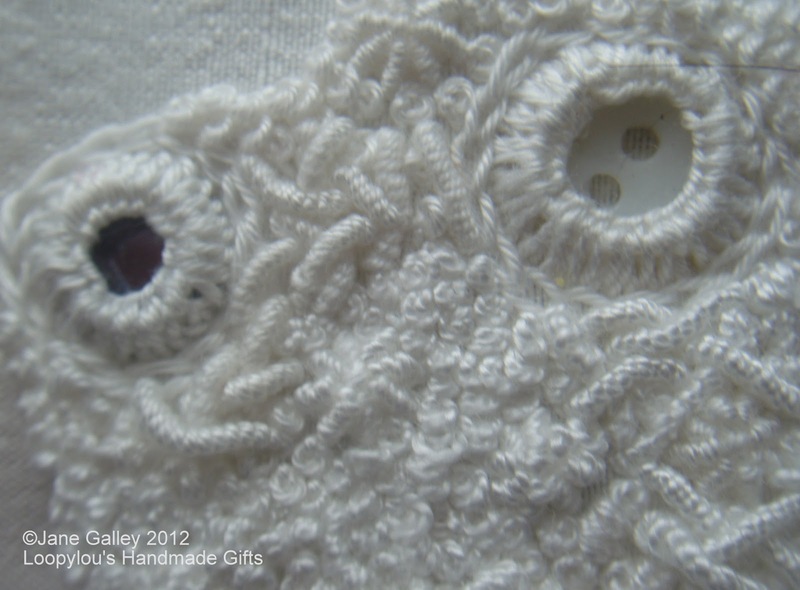 Once the buttons and mirrors were applied, I heavily embellished the area with hand embroidery. I really do like the way it seems to grow out of the cloth. 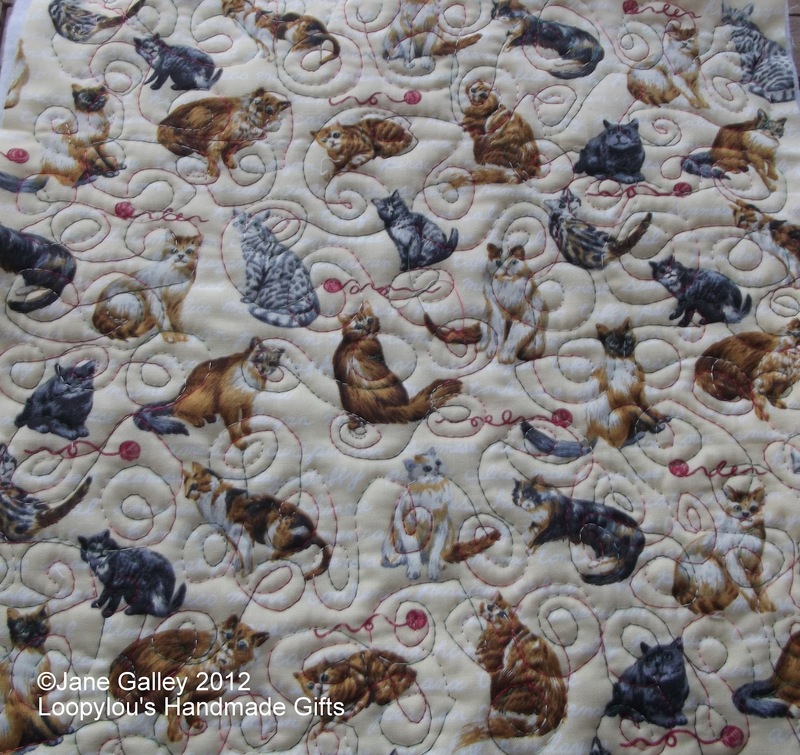 I have lots of buttons collected over the years, I may think of a way to incorporate them into a piece of stitching. 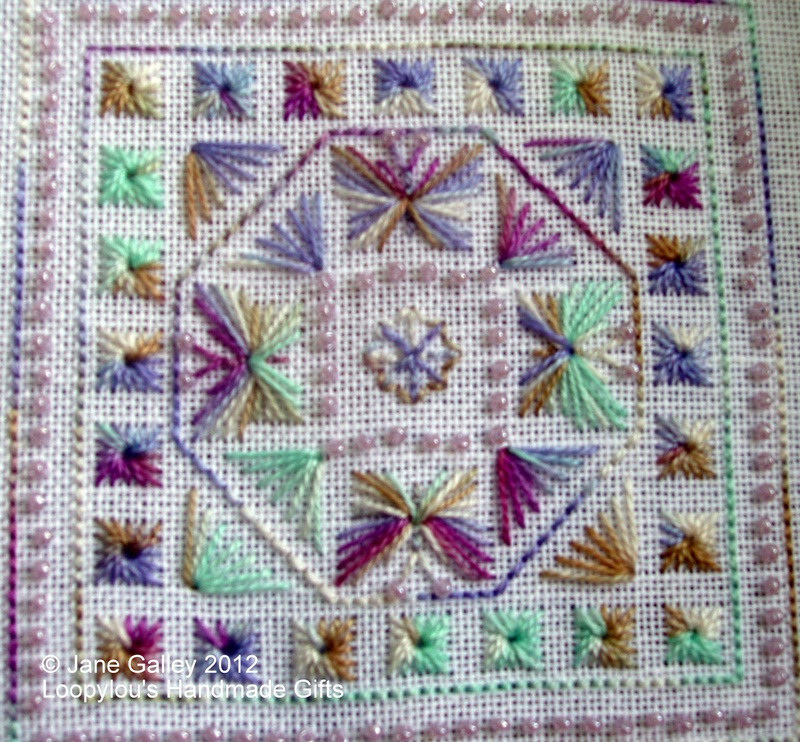 This is a technique that needs a little more practise, and some more scrim! 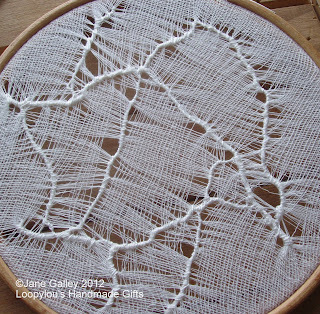 Warp threads were removed, then stitched on the machine to form "lace". 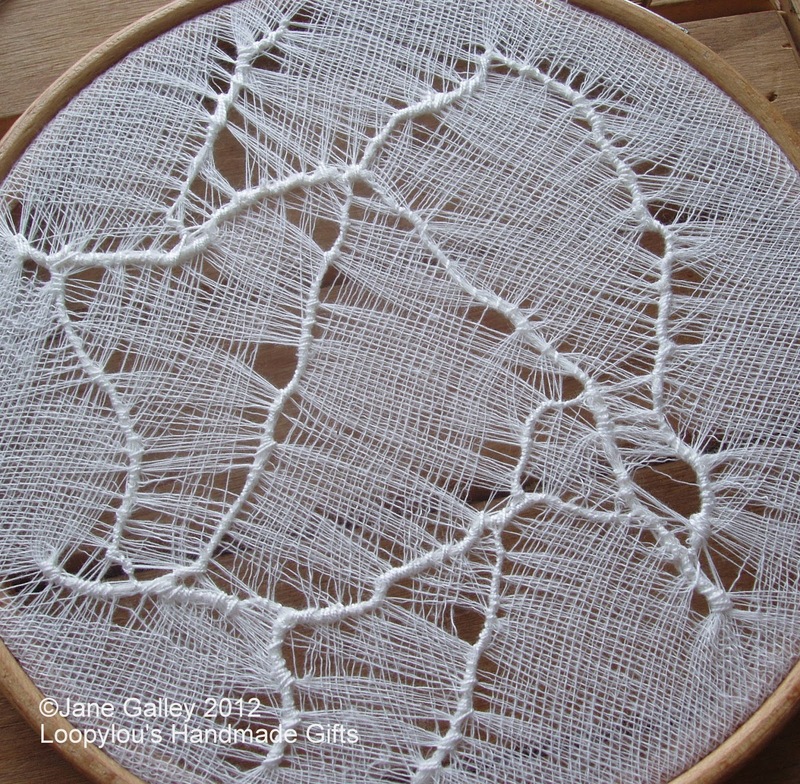 It's quite interesting to see the different ways it pulls together, and the different patterns that form, so I'm looking forward to trying this again. This next piece is adding a few elements together. The lace at the top is attached with a strip of french knots. 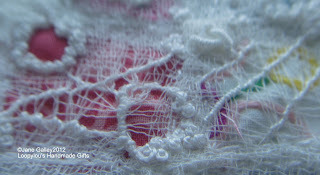 Behind the scrim is a vintage transfer on silk. Top and bottom, the scrim has been needle woven, and I think this is one of my favourite techniques from this class. I love the effect it gives. The bottom piece of scrim has nothing behind it, so the full effect can be seen. 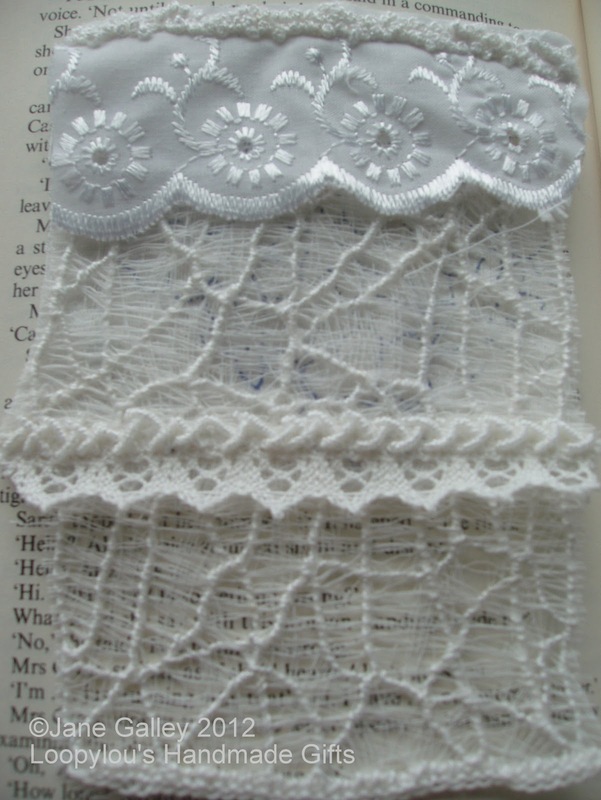 The lace in the middle is joined with bullion knots and the scrim at the bottom has been finished with buttonhole stitch and buttonhole lace. 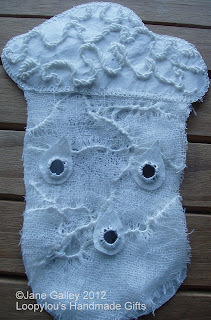 ... but I'm finally getting into the embroidery course and having fun. I'm beginning to catch up with all that has been going on, and hopefully won't be too far behind when the next lesson is released. 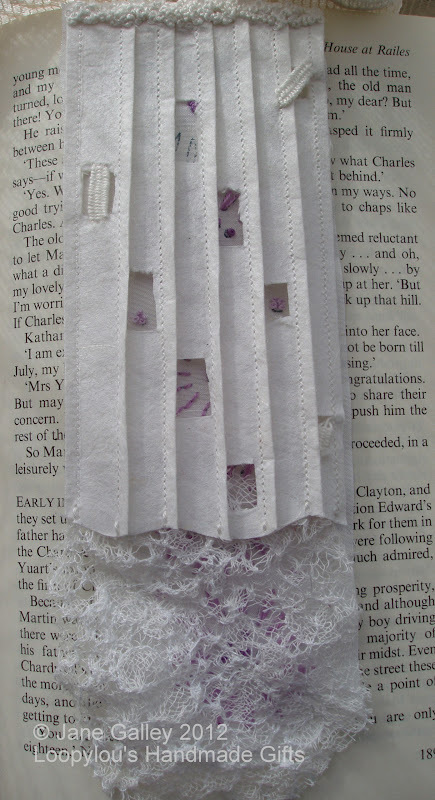 When we started playing with paper, I made a concertina fan out of a sheet of silk paper. I've cut this in half and added some hand embroidery. 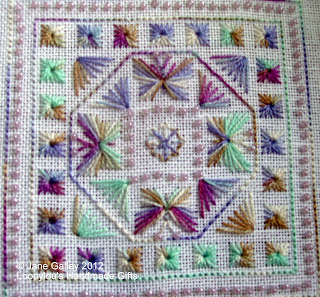 There are woven bars to keep the sides open and on the inside I've added splashes of colour with web stitches and french knots. 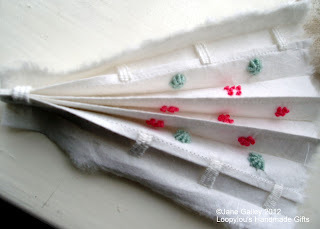 To keep the fan in shape, I've used needle woven bars front and back. 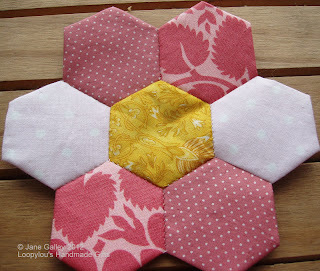 Remember the scrim pockets? 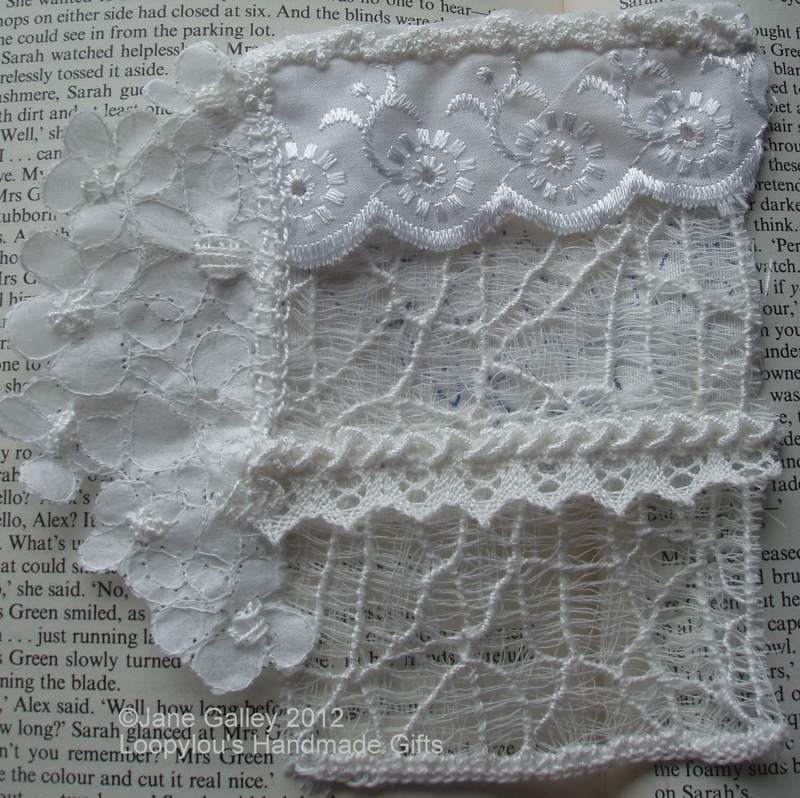 I've now taken these a stage further, applying the scrim over fabric and vintage embroidery. 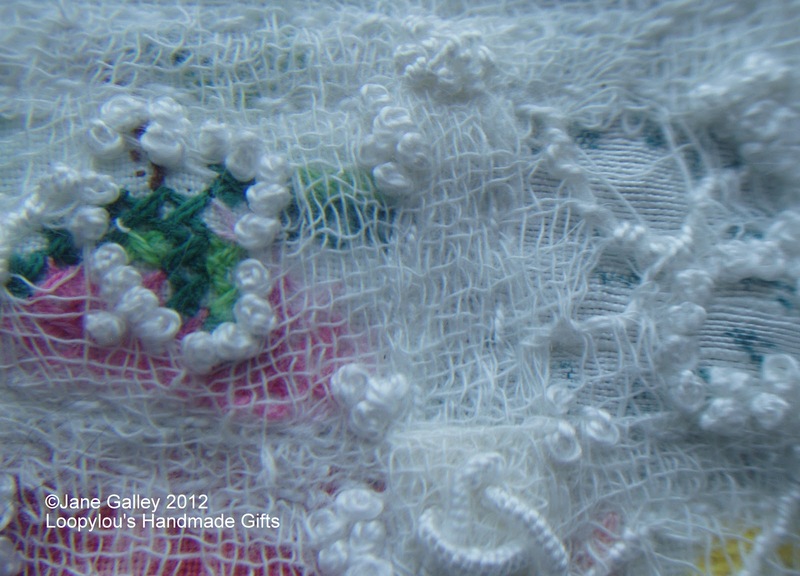 The scrim has then been embellished with hand embroidery. Small holes were cut in the scrim and then fixed with french knots, and there are lots of wrapped threads to form a lace effect. 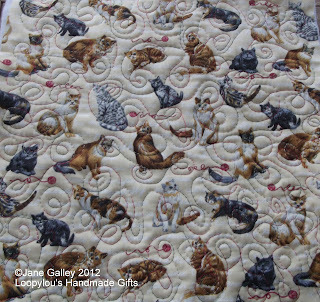 This allows the fabric and embroidery to appear from below. The finished piece is quite small, and hopefully will become part of a bigger piece. 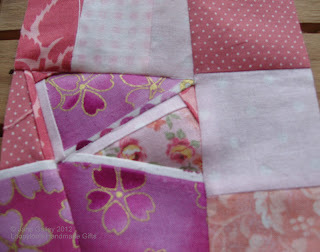 The next piece is prepared and I'm hoping for another happy stitching day today. The lovely thing about the latest embroidery course, is trying new things and putting them together. 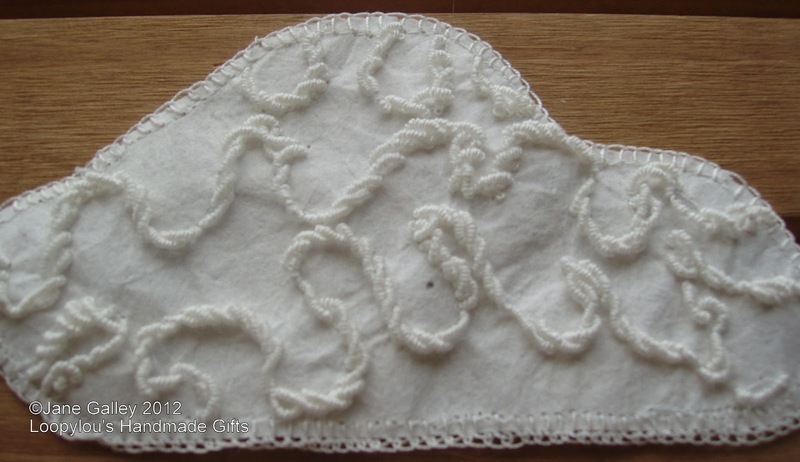 The first element of the next piece was this cloud. 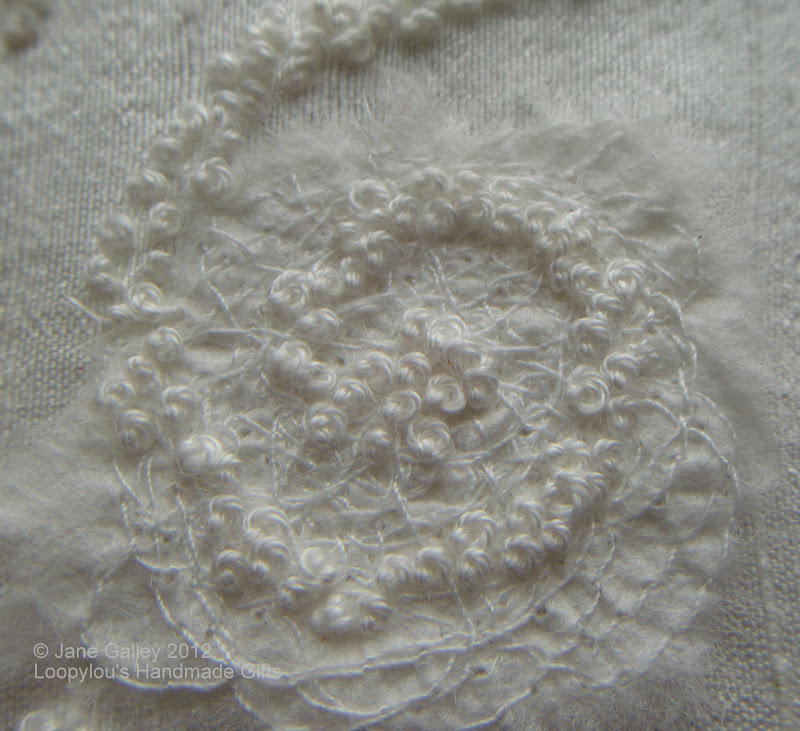 This is silk paper that has been machine embroidered and then further embellished with a buttonhole border, buttonhole lace along the bottom, and lots of bullion knots. and a vintage embroidery transfer on silk. The final piece wouldn't be complete without rain drops. This is silk paper with a shisha mirror. Here it is, all complete. A cloud, with it's life giving rain, to make the flowers grow. Knowing I had a swap, I had to get everything done, so they could be posted without worrying about missing the completion date. The three pieces I stitched became a needle case, a scissor pocket and fob. All that's needed now, is a button for closing, and the scissors to go inside. 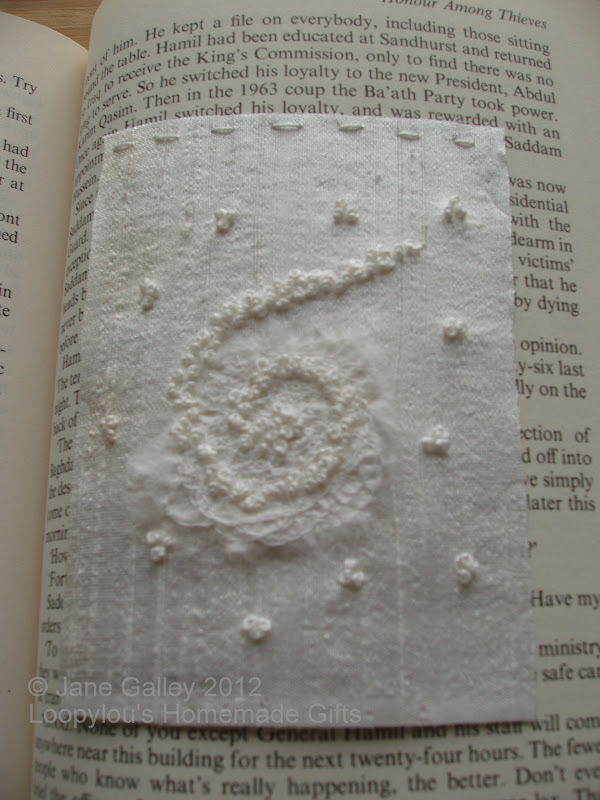 After a little break, I am finally back to needle and thread, continuing on with the samples of stitched paper. 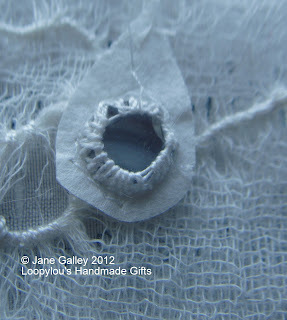 This sample is one of the holes that I'd machine stitched across the hole. I cut out close to the stitching and secured it to some silk. 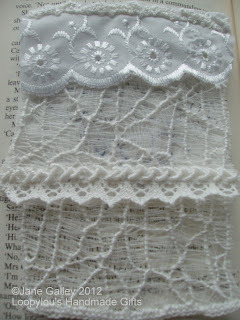 I then blanket stitched around the edge, and added some blanket stitch lace. 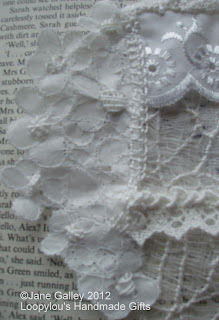 The backing lace was then cut away to leave the hole open. 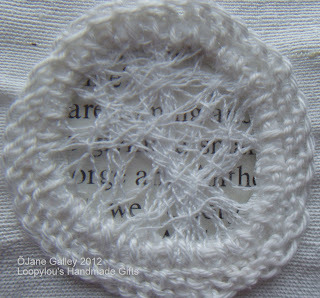 I like being able to see the writing coming through, but on a stitched piece, I would use some embroidery as the backing. 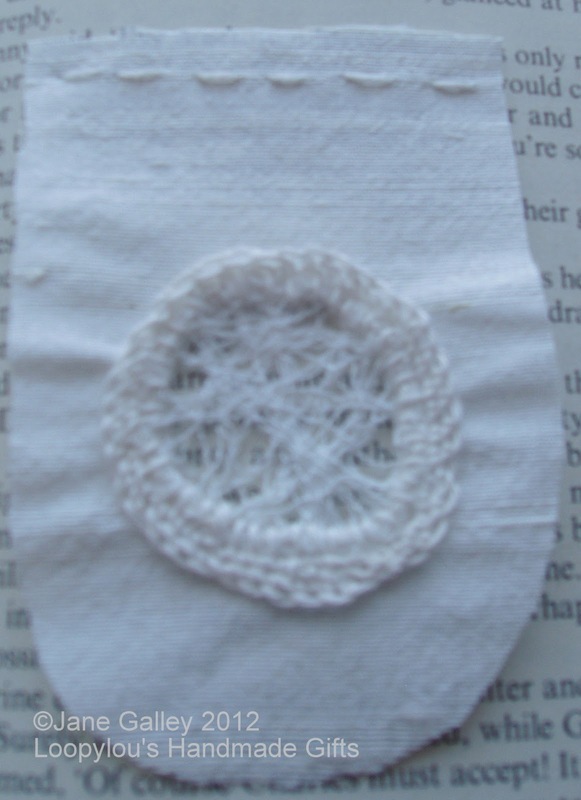 When I stitch these samples into the book, I just pick a page at random. I couldn't believe what was written on this page. I signed up for a swap on the TSS Yahoo group for a scissor pocket and fob. http://kincavelkrosses.files.wordpress.com/2010/06/rhodes-butterfly-biscornu1.jpg - which I thought I could adapt. 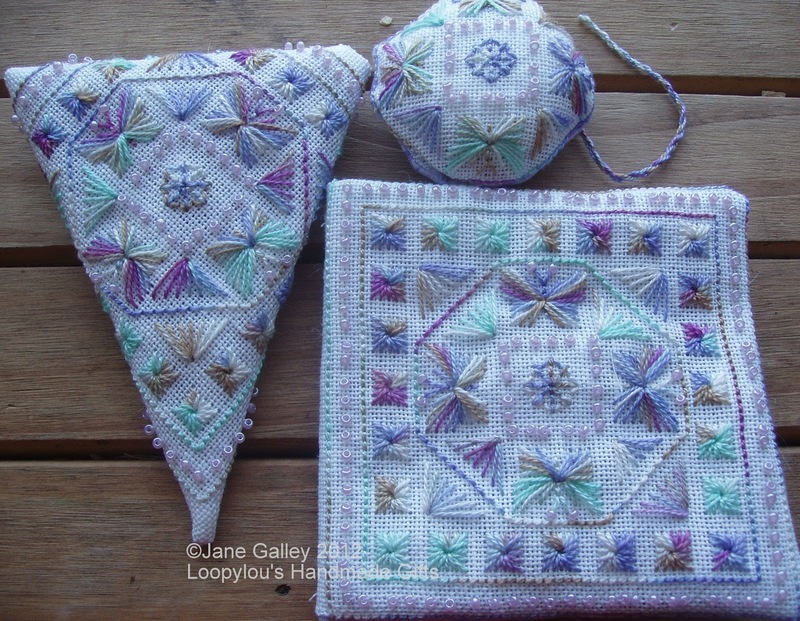 I've done this pattern, or part of it three times now. 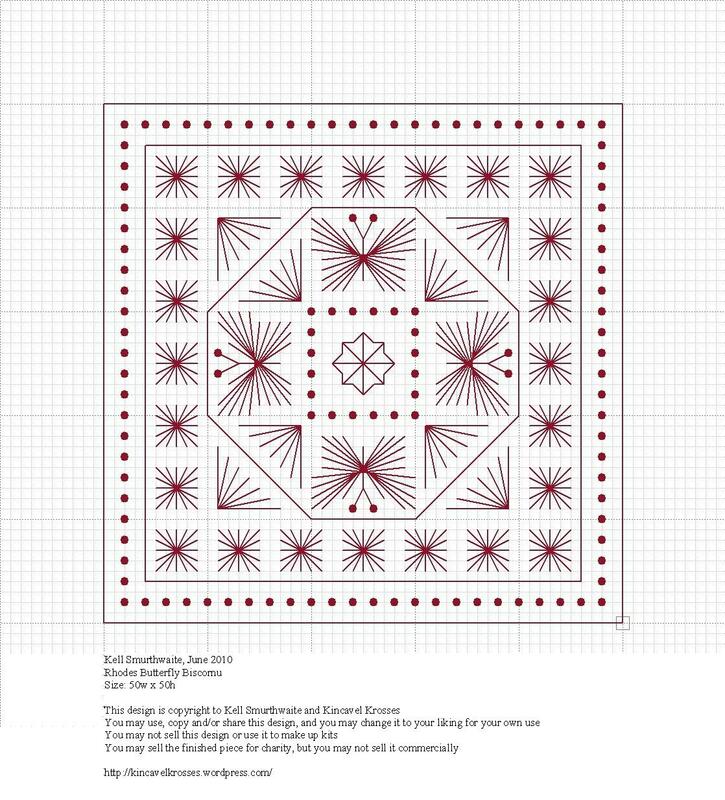 One for the scissor case, one for a needle case, and just the central design for the fob. Now I need to have a look to see if I have the fabric to make them up. Hopefully, it shouldn't take long, and they can be posted very quickly. De stash page has had some more magazines added, as well as a couple of vintage sewing patterns. In order to clear some space, the first 10 items will be removed at the end of this week, so if you're interested, please email me. This one has taken quite a little while to finish. 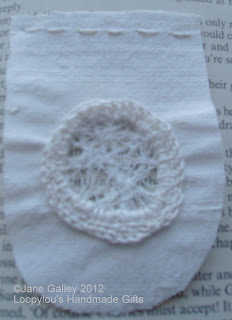 The pattern was easy to do, but being four ply, it took time to grow. It was made quicker by having a slash neck, the ribbing was done as part of the front and back pieces, so the sewing up part was quicker. It's quite a pretty blue, grey colour. 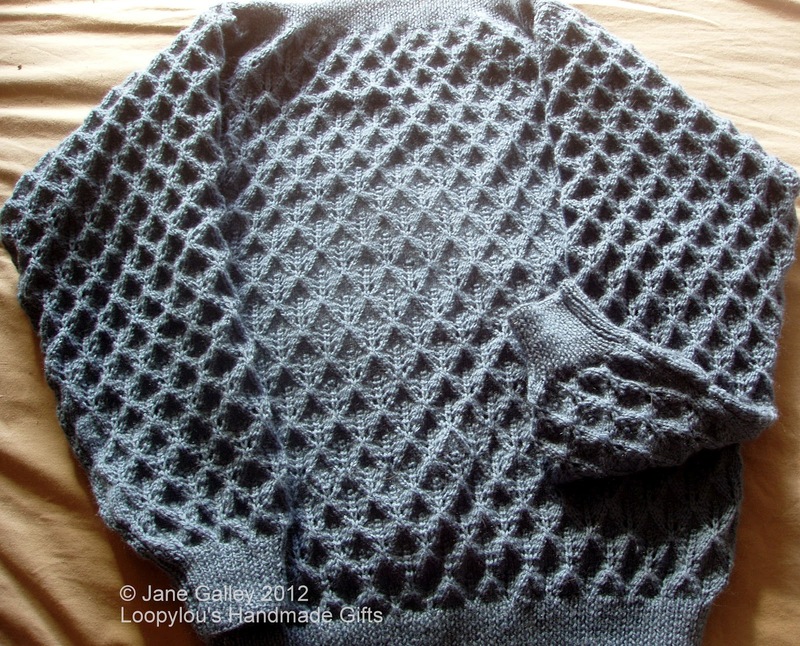 The yarn is Wendy Mode 4 ply, 50% pure merino wool, 50% fine acrylic, so was lovely and soft to knit with. 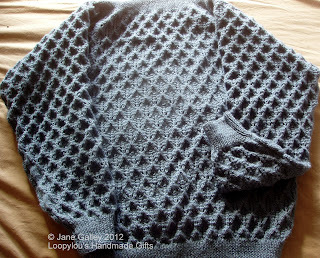 There is another project waiting for a finish in my knitting back, I just need to do some sleeves, maybe that will see the light of day before the end of the month. 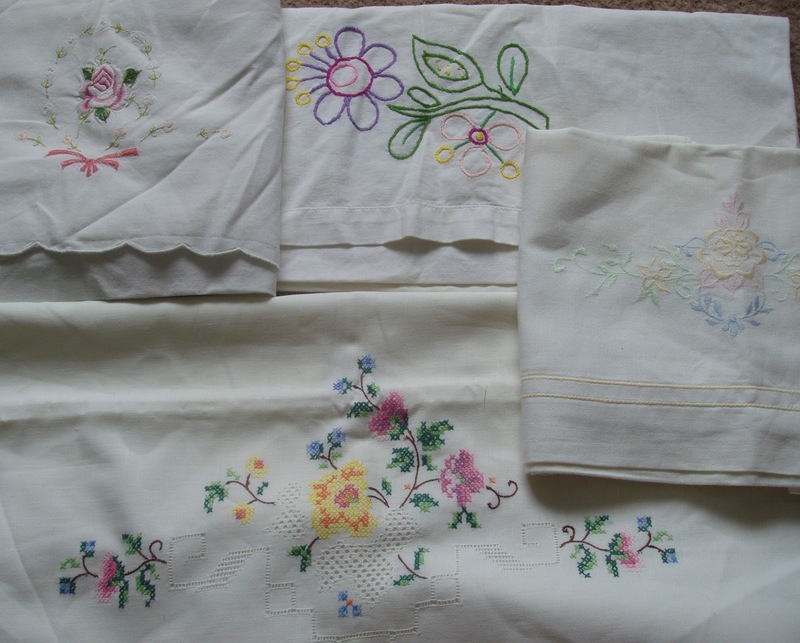 I didn't have a lot of vintage embroidered linens in my collection to use with my embroidery, so I did a little search on Ebay, and managed to win this collection, for just a small amount of money. I wasn't quite sure what I was going to get, as the picture wasn't the best, but I was pleasantly surprised when I opened the package. and so has this cutwork. It's amazing to think of the patience and skill involved in doing this with a cotton pillowcase. They are all now waiting to go into the washing machine, I wasn't so impressed with the smell of tobacco that hit me as I opened the envelope. 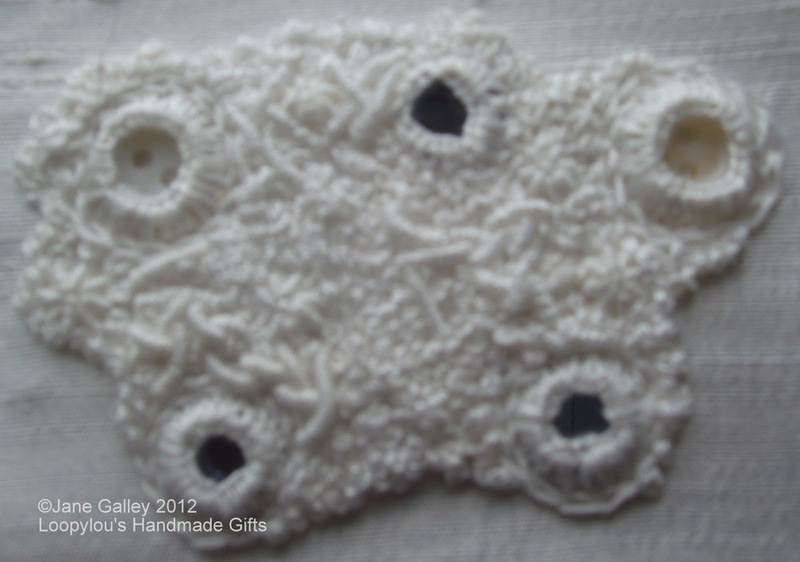 Hopefully, they will soon smell a bit sweater and add a little something to future embroidery projects. 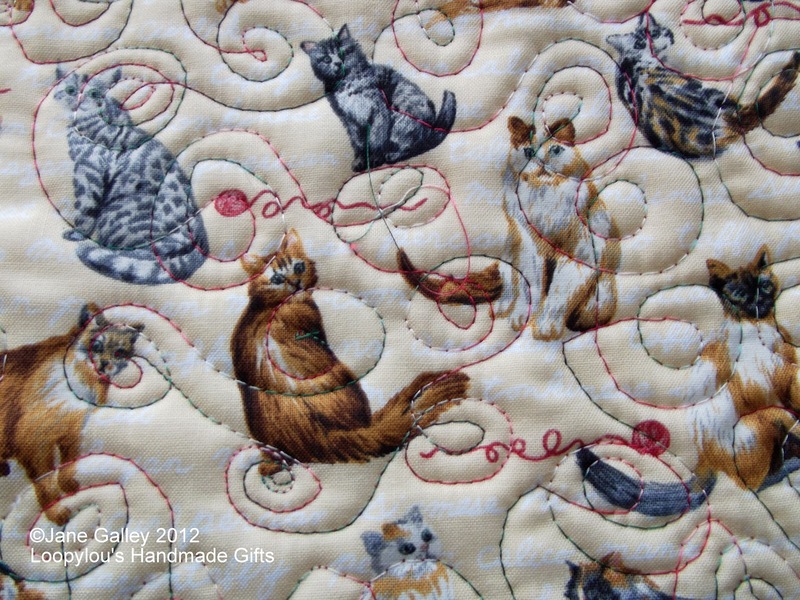 Knit Relief is an auction selling AMAZING handmade and personalised items, made by people all over the world who are trying to help Sport Relief! Have a look around at some of our lovely items, every penny you bid goes straight to Sport Relief! Once the fun with the sewing machine was over, it was time to use the samples in some embroidery, to embellish them and get some ideas for a larger piece. 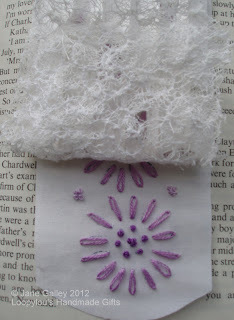 I used the over stitched piece of paper and added it to some dupion silk. 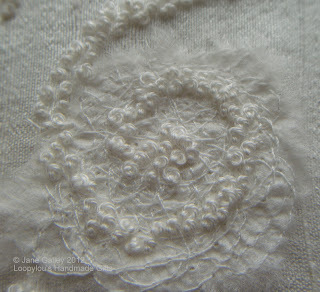 The spiral of french knots attaches the paper to the silk. 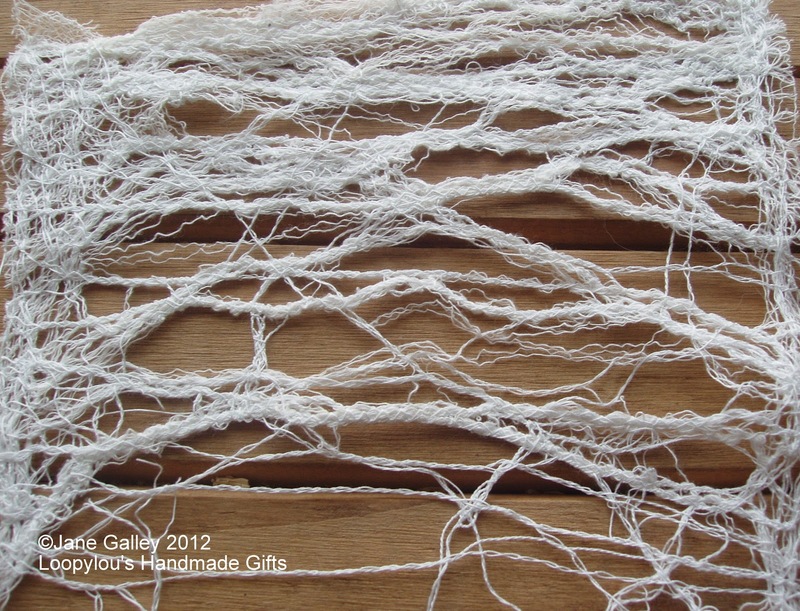 I do like the different textures of the the knots and paper together. 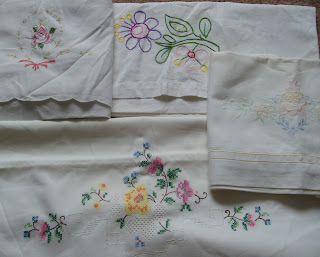 I don't have a lot of vintage embroidery to use, but I do have a collection of these patterns. The earliest I've found dated is 1933. They would have belonged to my great grandmother and grandmother, passed down through my mum. I used one of the transfers to stitch this. 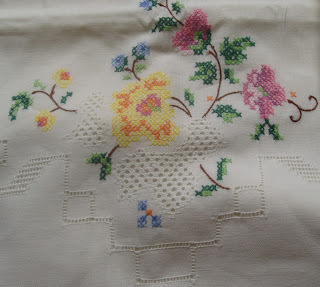 I left one incomplete, as lots of linen has been passed down only partially stitched. To it I added some pin tucked paper. 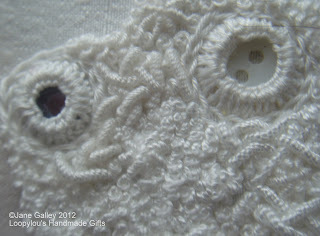 Holes were cut in it to form windows to the stitching underneath. Some windows have needle weaving over them. Attached to the bottom of the paper, is some machine stitched scrim. This can be lifted to reveal the stitching below. After some feedback from Karen, these ideas will be developed further. I think I should write some notes, my brain is mulling over new ideas and forgetting some of the old ones before I've had a chance to try them. Not sure what I'll do with the rest, but the thinking cap is on. 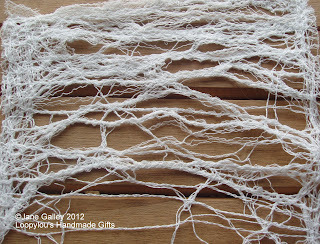 After playing with scrim, it was now time to play with silk paper. 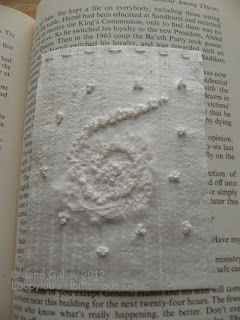 It was fun trying out the different stitches on the paper, and to see how resilient it is. 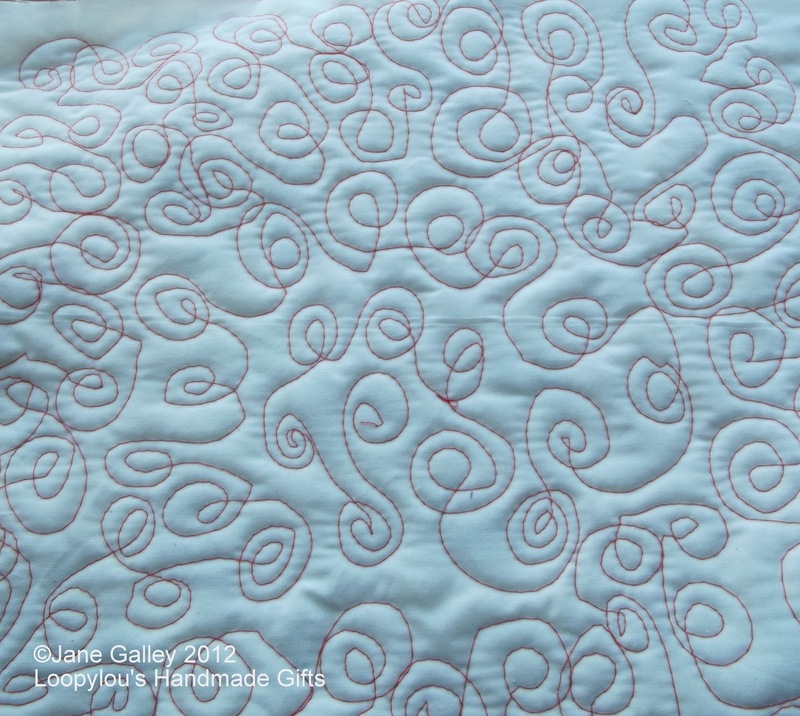 I like the edging this makes, just over stitching in circles backwards and forwards along a line, then pulling the excess paper away. This stitch would be great for an edge, one of my favourites. 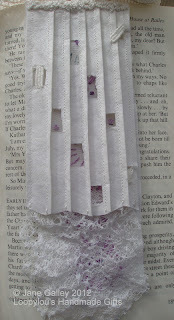 Now I'm looking forward to combining the scrim and paper with other fabric and hand stitching. Hopefully. 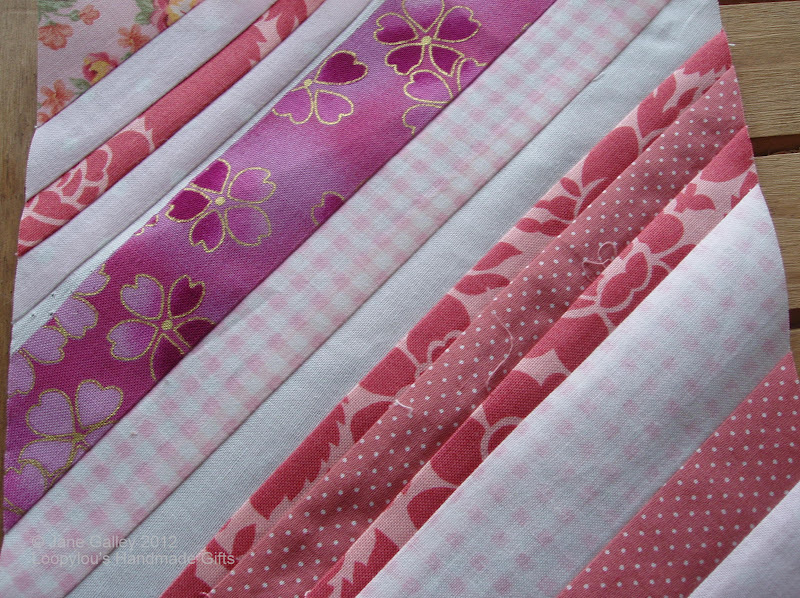 a few more stitched samples will follow. 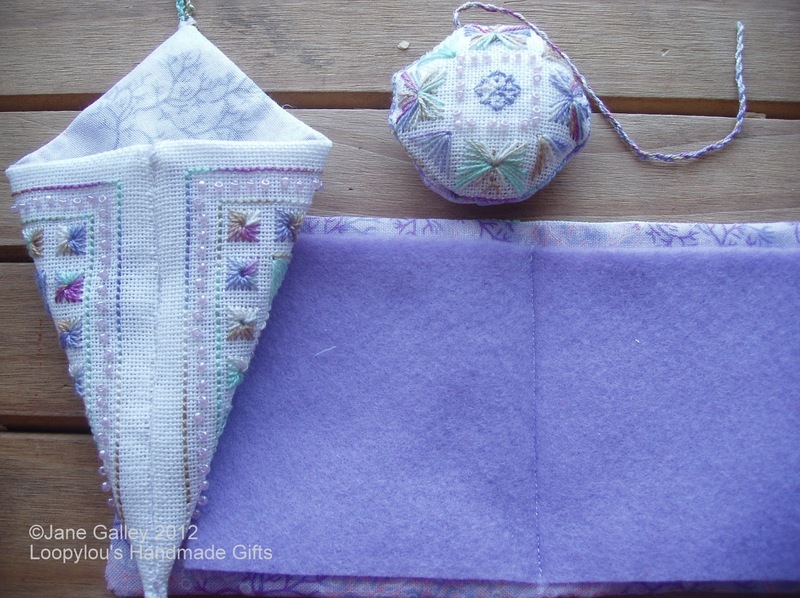 The third hardanger is complete, and I have a bookmark to show for it. This was one of those projects that didn't look that much until it was finished. Once the excess fabric had been cut away, it looked pretty good. I am pleased with how it turned out. Lesson four has been printed, but yet to be started.